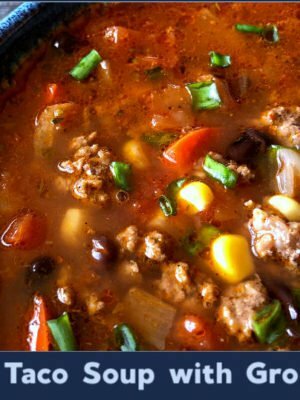 How about an easy 25 minute soup recipe today? You just need a few pantry staples, a pack of refrigerated tortellini, and some fresh spinach to re-create this comforting vegetarian soup. 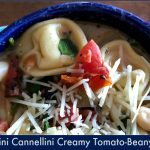 Tortellini soup is always easy to throw together for a quick Meatless Monday dinner (or, really, for any weeknight meal), but today we’re taking things up a notch with… Tortellini Cannellini Creamy Tomato-Beany Soup! 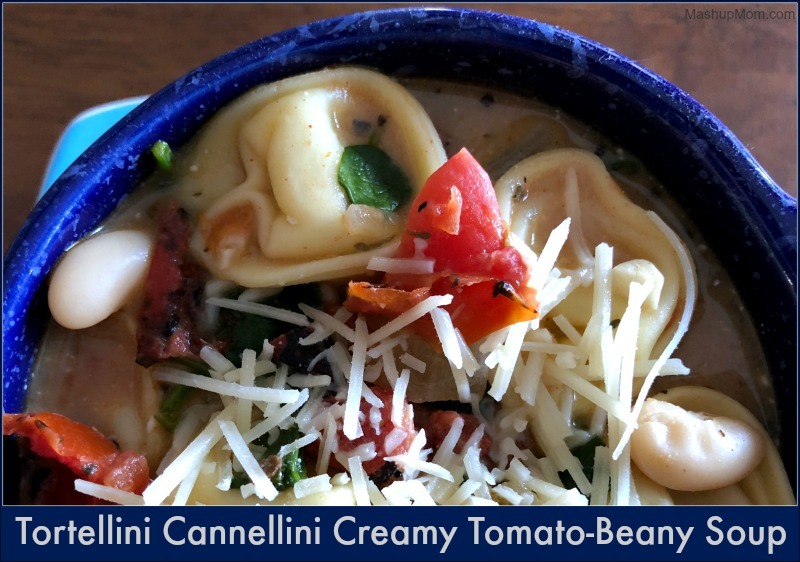 The cheesy tortellini and filling beans here help make this soup hearty enough for even the confirmed carnivores in your family, while the optional Parmesan topping nicely complements both the smoky tomatoes and the creamy broth. Put cream cheese out on the counter to soften (helps it melt more easily into the soup later). Heat olive oil in a large pot or Dutch oven over medium heat until shimmering. Add onion and saute for two minutes, stirring occasionally, until it begins to soften. Add garlic and saute for another minute. Stir in broth, water, tomatoes, and spices, and bring to a rolling boil. Stir in tortellini, reduce heat to medium-high, and simmer on a low boil until cooked through, about three minutes. Stir in beans, spinach, and cream cheese. Reduce heat to medium, and continue to simmer, stirring gently, until spinach wilts and the cream cheese is melted and incorporated nicely into the soup (about four minutes). Serve your creamy tortellini soup garnished with shredded Parmesan (optional). 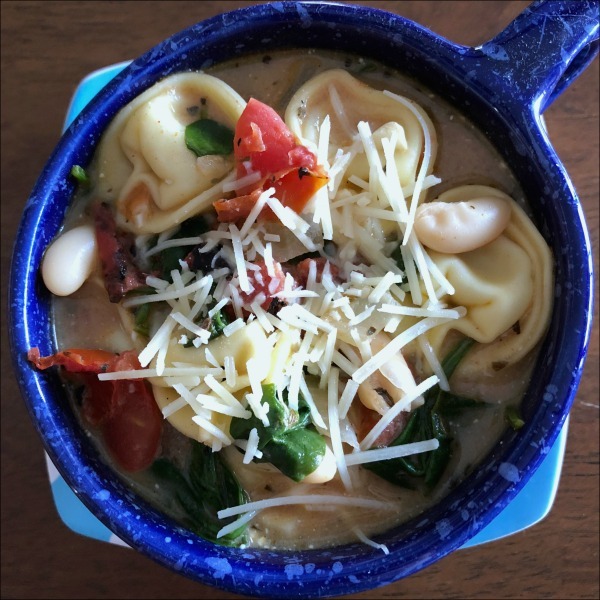 The cheesy tortellini and beans here work together to make this soup hearty enough for even the confirmed carnivores in your family, while the optional Parmesan topping nicely complements both the smoky tomatoes and the creamy broth. 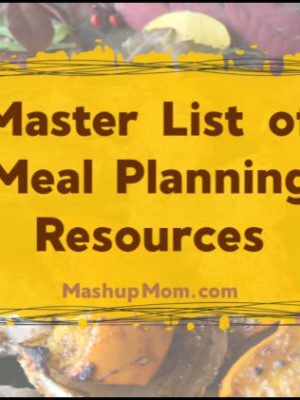 And be sure not to miss the free weekly ALDI meal plans, which help you use these recipes to meal plan affordably and realistically for your family. I try to cut calories when possible so I was wondering if the cream cheese I said necessary? How would it affect the taste if left out? 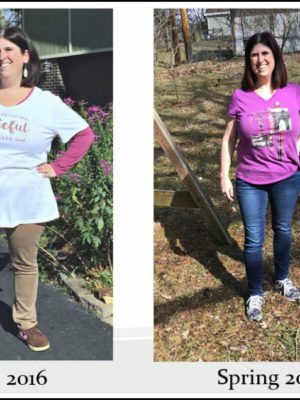 Thank you for al your recipes! Well, it wouldn’t be creamy — the cream cheese adds both cream and a bit of tang to the soup. There’s only 3 oz in the whole thing, so you could substitute the neufchatel or leave it out, taste, and maybe add a small splash of red wine vinegar or lemon juice at the end to add a little acidity if it seems still to need something. Where is the 1 cup of water used? Or did I miss that? Sorry, along with the broth! I just clarified it in the post. 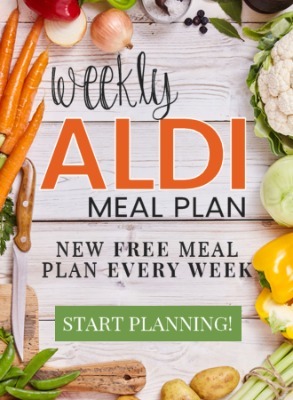 Oh my goodness gracious… I’m a new subscriber and am following the Aldi meal plan this week (and maybe all the weeks to come! Lol!). I’m a day behind schedule so we had the Tort soup tonight.. WOW! 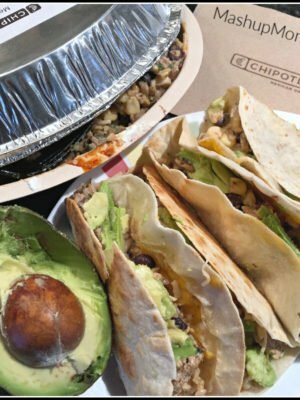 This will be added to our regular meal rotation! Thank you!!! Would you recommend doing this in a Crock-Pot? I thought I could do everything but the tortellini and spinach until the last half-hour? Thinking of making this for a New Year’s Gathering. I haven’t tried it, but yes — if I were to try, I would add the tortellini more like 15 minutes before serving, then wilt in the spinach and melt in the cream cheese at the end. Thanks! I’m excited to give it a shot and share. This has been a meatless go to for my Son & I, it has so much flavor and we just love it!